#WalkInRed is an online/virtual social media campaign that takes place each year during the month of April. 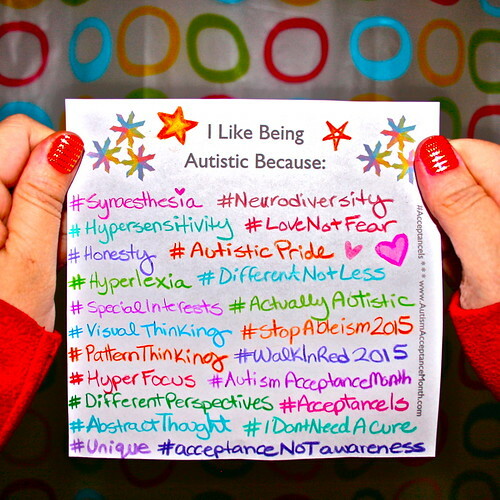 The idea is for #ActuallyAutistic individuals and allies to post selfies wearing red shoes, socks, lipstick, nail polish, other clothing or anything else red like food, toys, printed signs, etc. These images are meant to act as a positive beacon; making a typically blue month much happier through #love. 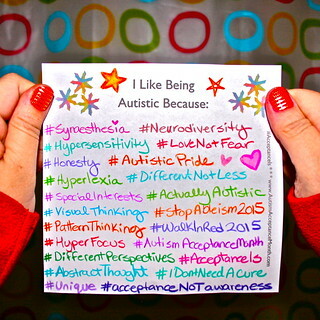 2015 is the first of many flashblogs and tweetstorms in the name of equality, understanding and #acceptance.